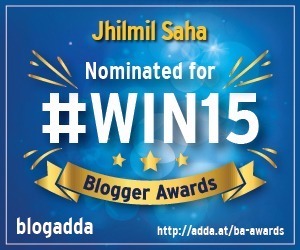 India is known for her rich cultural heritage and innumerable festivals across the world. No matter what season it is or what month it is there is always a festival being celebrated in some corner of our country. The beginning of autumn is when the festival time truly commences and it actually continues till the cold winters. Ganesh Chaturthi, Durga Puja, Navaratri, Diwali, Eid, Christmas- we have a long list of festivals.This is the time where the majority of Indians are spotted in traditional clothes, be it irrespective of men and women. 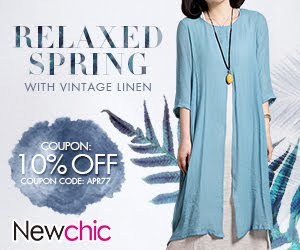 The most celebrated Indian wear for women is, of course, sarees and India has its own variation of designs, draping and fabrics from place to place. Almost every state has its share of its own popular sarees, starting from the Banarasis of Benaras, to the Chanderis of Madhya Pradesh to the Patolas of Gujarat to the Kanjeevarams and Pochampallys of South to the Taants & Baluchoris of Bengal to the Mekhlas of Assam, we have it all. Saree is an eternally beautiful outfit that can make every woman look her finest. 1. 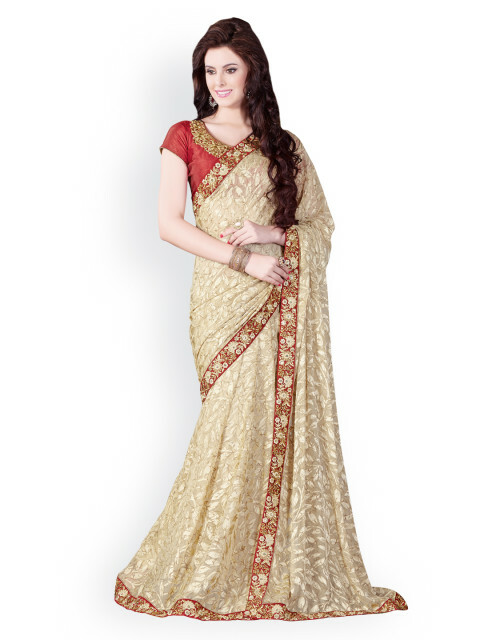 SATIN EMBROIDERD LACE SAREE: This kind of design has a unique blend of feminism and style. The satin’s shine and the touch of lace are what we call elegance in a single piece. 2. 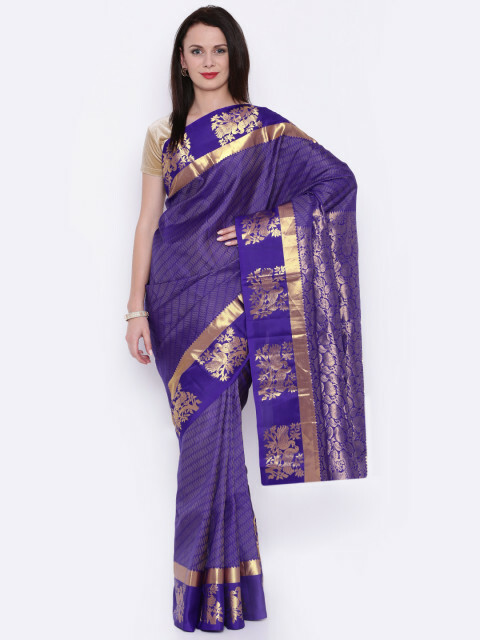 PURE SILK WOVEN KANJEEVARAM: No girl can resist the urge to wear a woven pure silk kanjeevaram. It’ll make you look like a queen ready to rule the world. 3. 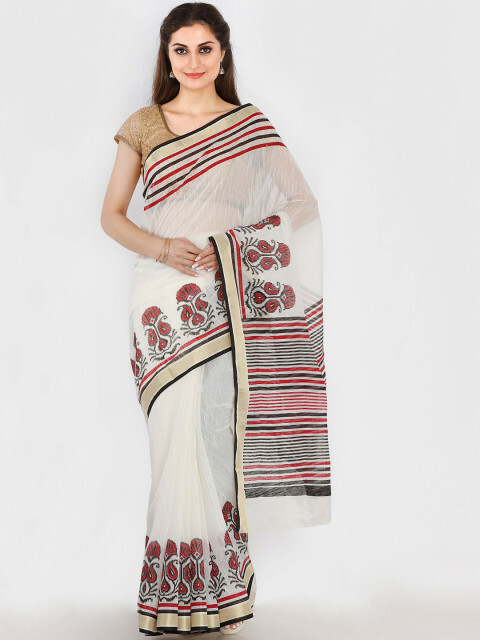 RED & WHITE HALF & HALF SAREE: This one is especially for the Bengali ladies to wear on the day of ASHTAMI which is like the 8th day of Navaratri. Red & White really depicts the Bengali culture. 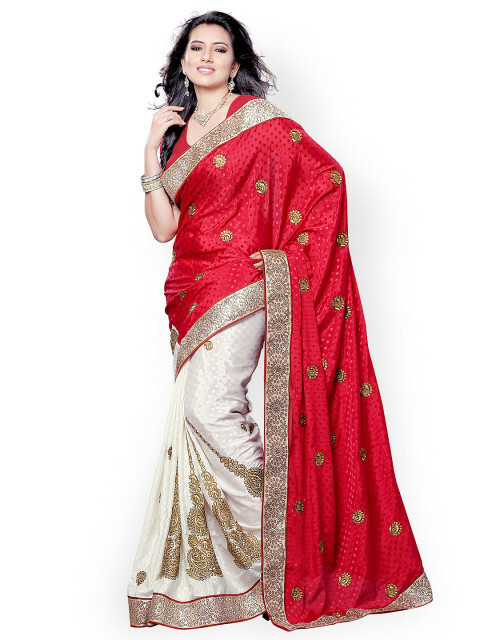 All the ladies of each household own at least one red-white saree for the puja purposes. 4. COTTON-BLEND SOLID CHANDERI SAREES: This famous Madhya Pradesh silk not only looks sophisticated but the blend of cotton in it makes it comfortable to wear. 5. 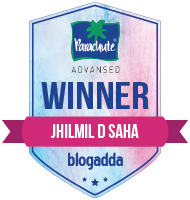 POLY-GEORGETTE COLOR BLOCK SAREES: This one’s for beginners and girls who doesn’t want to experiment much. 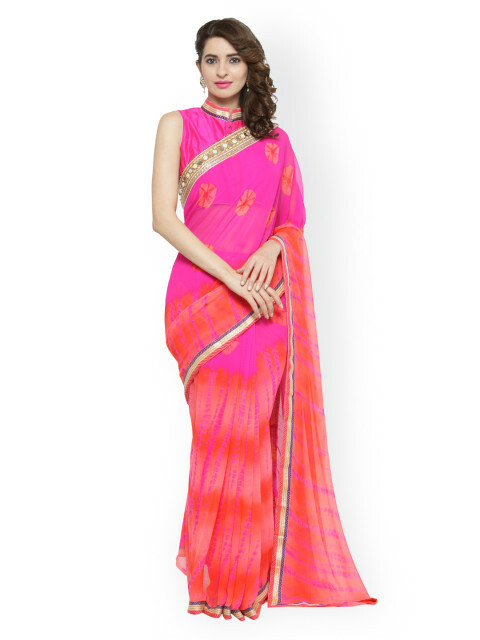 Color-block sarees are totally in and since it’s georgette it’ll not crease. 6. 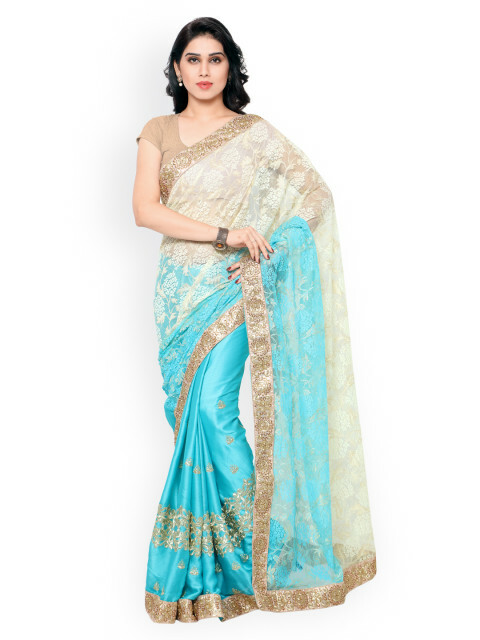 EMBELLISHED POLY CHIFFON SAREE: Chiffons are another favorite of saree lovers and especially when it’s embellished. It makes everyone look royal and majestic. 7. 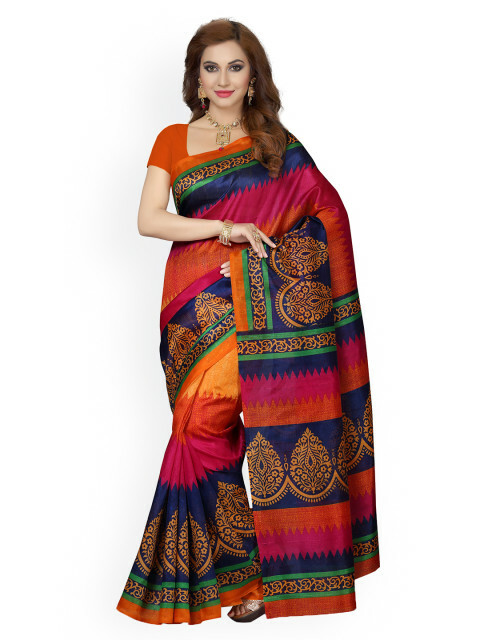 BHAGALPURI ART PRINTED SILK SAREE: Adding a little touch of art makes it look even more cultural and traditional. 8. BRASO PARTYWEAR SAREE: Woven Brasso sarees makes us look very classy and elegant. It’s the epitome of aristocracy and sophistication. 9. BANARASI SAREES: Oh, the love for Banarasi sarees is eternal. No one can get enough of it especially during the festivities. 10. 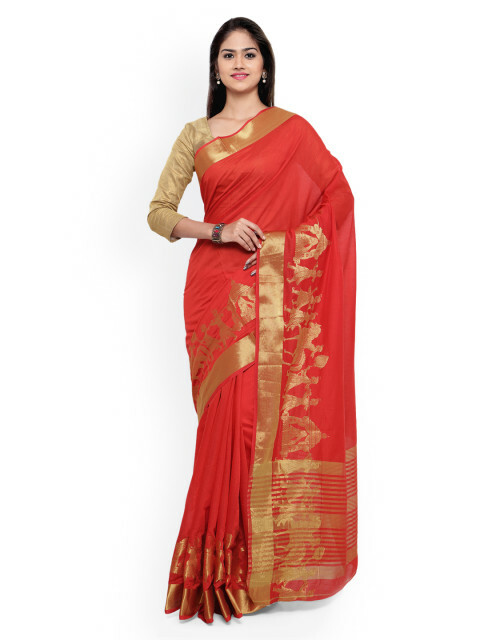 SOLID COTTON SAREE: Now, in case if you are bored of the silks and chiffons we have cottons. They not only look good but feel super comfortable and are safe to wear. Sarees are an epitome of Indian tradition and no one actually deny that. The history of the nation and the mythologies also had to include the importance of the nine-yard in some way or the other. With the craze of online shopping it has become even more easy to get the sarees of our choice, anytime from anywhere.